It was just a quick trip to Hawaii. After standing up in a wedding and celebrating with the newlyweds, I had 24 hours to do as I wished. My goal? To experience as much of Hana as possible. Here’s what you can do with 24 hours in one of Maui’s most spectacular regions. After viewing a spectacular sunrise, I set out in search of the Red Sand Beach. I had been told it was outside of Hasegawa’s General Store, but when I asked an employee, she grimaced and told me it was on private property. Defeated, I walked outside. Moments later, an island resident named Billy asked with a grin if I needed help to the beach. He then led me step by step to one of the most scenic beaches I have ever seen. After tackling a scree-ridden trail above beach shores pounded by foamy surf, the trail descended to a shore of black and burgundy-speckled porous rock and sand. The beach is small, and rings towards an alcove. Arrive early, and you enjoy it alone as I did. Nothing beats quiet, solitary, introspective moments on the shore of one of the world’s most beautiful beaches. How to get there: Head north of the Hasegawa General Store in Hana, turn right at the church. Park your car and look for a yellow gate. Walk past the yellow gate towards the shrubbery on the right, and past a pole mounted in cement. Locals cover the beginning of trail with branches and leaves. Look beyond the initial pile and a trail will appear, accompanied by signage. Follow the trail to the left until you reach the beach. Pack light and wear sturdy footwear – the trail is covered in gravel and scree, and could prove dangerous if ill-prepared. Driving aimlessly hoping for a suitable dining option, I was elated when a small street-side diner – with an outside seating area and mobile “wagon” kitchen – came into view. Phyllis, the resident hostess, waitress and chef for the past 12 years, greeted me with an explosion of energy and sass. Clearly well-caffeinated, Phyllis recited through a thick Boston accent countless nuggets of little-known knowledge about Hana’s history. She discussed Hana’s past, future, natives and culture while accommodating customers at lighting speed, never missing a beat or breath. She recommended the waffle sandwich, and she was spot on. In between two large square waffles sat fried eggs and bacon, all topped off with generous squares of butter, drowned in syrup and decorated with an orange flower. As I voraciously dove in, Phyllis brandished an overloaded binder of postcards, letters and mementos of happy patrons. Just 10 minutes north of Hana, volcanic black sand on Pa’iloa Beach awaits. 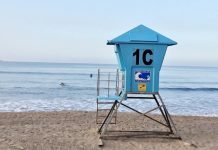 The beach is yet another one of Maui’s treasures that tops global “best of” beach lists. I drove to the park and easily found may way down to a gorgeous black beach, a small treasure only 100 ft wide. Crashing waves on black sand crawl up the shore, while deep blue sea trails as far as the eye can see. 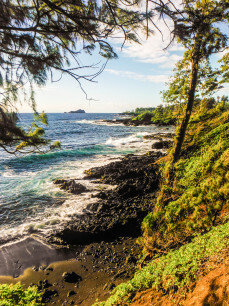 If you have time, jump into spring-fed freshwater caves, explore lava tubes and check out blowholes that erupt like geysers, all in a short walk around Wai’anapanapa State Park. If you decide to camp at the park, book online and print out your reservation – or be turned away by the ranger with no exceptions. While many see Hana by foot or car, few see its majestic beauty from above. 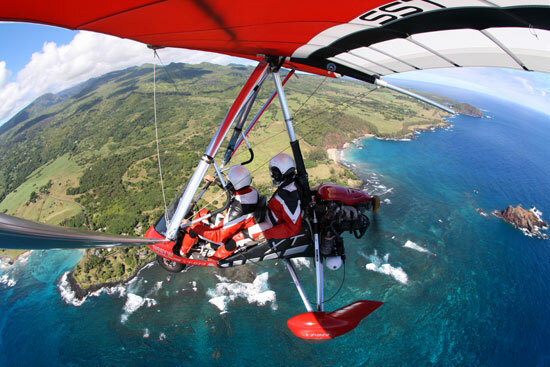 Armin, the owner and instructor at Hang Gliding Maui, provides a lesson and ride that you will never forget. Clad in the company-provided red and white leather garb, I climbed into the back seat. A 30-year hang gliding veteran with an impressive 25,000 customers under his belt, Armin spoke to me through the headset in my helmet, pointing out landmarks such as the A’lua bird sanctuary, Waimoku Falls, and lava valleys while allowing me to steer and take the reigns. We rose 3,500 ft. into the air and coasted on jet streams above the sea. While this activity isn’t cheap ($170 for 30 min, $280 for 60 min), it proves to be a priceless experience. Leaving Wai’anapanapa State Park and driving to Haleakala National Park requires a 13-mile drive affording scenic views. As you enter the national park be prepared to pay a $10 fee for entry. 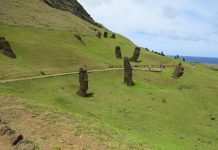 The park is easy to navigate and the Pipwai Trail is not hard to find. This trail is four miles round trip, but tack on extra time for the sights. What should have taken me an hour and a half took nearly three I stopped so many times to take in the beauty. The hike provides a tame workout, climbing only 650 ft. in elevation. 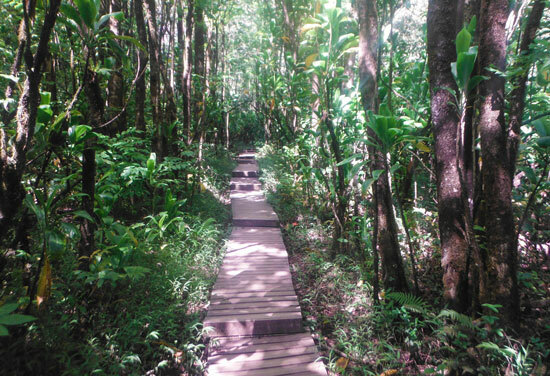 The short hike journeys through Banyan Trees, waterfalls, tropical flora, a bamboo forest and much, much more. The majestic view of the Waimoku falls showering 200 ft. down from the sky is a perfect place for a mid-hike snack and rest. Bring water and wear shoes with toe protection that you don’t mind getting wet. After your hike, you will be sweaty and ready for a dip. The O’heo Gulch, known previously as the Seven Sacred Pools, offers the perfect solution. The large pool is surrounded by several waterfalls and tropical plant life. The crisp waters are welcoming after hiking in the heat, and given the popular location, you won’t be alone in your quest. Mornings are the best time to visit, but be prepared to share your experience with many other tourists during the afternoon. As I drove on towards the Haleakala summit, my mouth salivated as a street-side food stand came into view. I had been prepared to eat an orange and crackers in my car for dinner, but fate handed me a gift. Bully’s Burgers grills up a tasty burger – I added mushrooms, swiss, avocado, mayo, tomato, lettuce, onions and jalapenos – with a side of tortilla strips and an ice cold pop. Sit at a picnic table and chat while taking in a breathtaking view of a cliffside coast next to a lush, green mountain base ascending into the clouds. If you’re full, feed your leftovers to a hungry pet pig through a wooden stall next to the garbage cans. 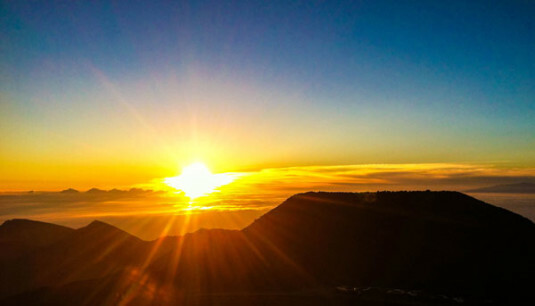 Viewing the sunrise from Haleakala, the massive shield volcano that forms more than 75 percent of the Hawaiian island of Maui. Photo by Gina Kremer. I drove the back route to the Haleakala summit, on unpaved roads, in opposition to several written terrain warnings. Don’t be afraid of the back route – I didn’t blink twice driving in my four door sedan. When compared to the lush, thick and abundant plant life hedging the road to Hana, the back route looks very different. 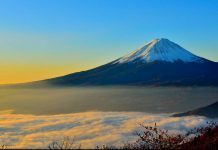 You will pass by beautiful houses and plant life, but you will also have large, sweeping views of green, jagged mountains ascending into thick white clouds. As you drive up the Haleakala summit, the road takes an endless amount of turns and twists. The views changed from blazing, to pink, and dark gray as the sun set. I reached the summit as the final rays of sunlight extinguished from the sky, then spent my evening stargazing into an undisturbed sky with a flask of Wild Turkey in a sleeping bag. I sat by myself at 4:30 a.m. to watch the sunrise, and within an hour I was joined by 100 of my new closest friends. I was the warmest by far, bundled up in a sleeping bag and sitting comfortably on a ledge. Very slowly, the sun rose bit by bit, illuminating the clouds and spreading streaks of color in its wake. After the sun rose, we all remained, mesmerized by the scenery. Check the Haleakala website for sunrise times, and then arrive with warm blankets and sleeping bags at least an hour beforehand. Parking lots and roads fill quickly, leaving few options for frantic stragglers. As I drove down Haleakala after sunrise, I tried to pick which part of the past day had been my favorite. I couldn’t pick. They were all too special, too beautiful, and too amazing to pick just one. Open Monday – Friday 6:00 a.m. – 1:00 p.m.
See instructions above, start in Hana at the Hasegawa General Store located at 5165 Hana Hwy, Hana, HI 96713. In Hana at end of Wai‘anapanapa Road off Hana Highway (Highway 360), 52.8 miles (3 hour drive) east of Kahului Airport. No entrance fee. Info is on the Hawaii State Parks website. Open Monday – Sunday, 11:00 a.m. – 7:00 p.m.